There are so many owies in my house. From sunburns to bug bites to bruises and scrapes, my three kids are ever in need of natural pain relief. 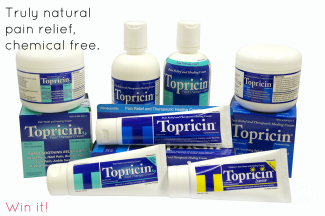 That’s why I was excited to discover natural pain relief in the form of Topricin, a new addition to my tried-and-true remedy of soap + water + bandage + kiss. Heal Yourself, Heal the World!